Stephen Kantrowitz. More Than Freedom: Fighting for Black Citizenship in a White Republic. Penguin Press, 2012. Abraham Lincoln’s Emancipation Proclamation is generally understood as the moment African Americans became free, and Reconstruction as the ultimately unsuccessful effort to extend that victory by establishing equal citizenship. 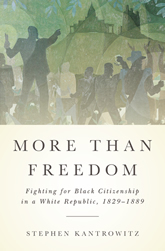 In More Than Freedom, award-winning historian Stephen Kantrowitz boldly redefines our understanding of this entire era by showing that the fight to abolish slavery was always part of a much broader campaign to establish full citizenship for African Americans and find a place to belong in a white republic. More Than Freedom chronicles this epic struggle through the lived experiences of black and white activists in and around Boston, including both famous reformers such as Frederick Douglass and Charles Sumner and lesser-known but equally important figures like the journalist William Cooper Nell and the ex-slaves Lewis and Harriet Hayden. While these freedom fighters have traditionally been called abolitionists, their goals and achievements went far beyond emancipation. They mobilized long before they had white allies to rely on and remained militant long after the Civil War ended. These black freedmen called themselves “colored citizens” and fought to establish themselves in American public life, both by building their own networks and institutions and by fiercely, often violently, challenging proslavery and inegalitarian laws and prejudice. But as Kantrowitz explains, they also knew that until the white majority recognized them as equal participants in common projects they would remain a suspect class. Equal citizenship meant something far beyond freedom: not only full legal and political rights, but also acceptance, inclusion and respect across the color line. Even though these reformers ultimately failed to remake the nation in the way they hoped, their struggle catalyzed the arrival of Civil War and left the social and political landscape of the Union forever altered. Without their efforts, war and Reconstruction could hardly have begun. Bringing a bold new perspective to one of our nation’s defining moments, More Than Freedom helps to explain the extent and the limits of the so-called freedom achieved in 1865 and the legacy that endures today.